The Akron (OH) Beacon-Journal today featured the retirement plans of Grace College and Seminary alumnus Knute Larson (pictured). Here is an excerpt. To read the entire article, click here. Jeanine Larson has been saying a special prayer for her husband for the past three years. On Wednesday evening, her husband, the Rev. 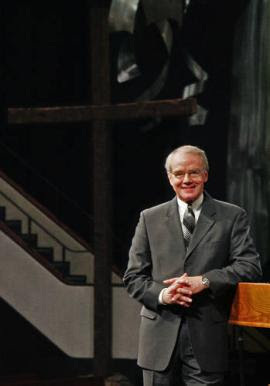 Knute Larson, said the time to leave his post as co-senior pastor of The Chapel will be May 17. He will leave after more than 25 years of leadership that has motivated the spiritual and physical growth that has made the 8,000-member church the largest in Summit County, with campuses in Akron and Green. The nondenominational church offers six worship services and more than 300 weekly activities. Although the membership meets in two locations, the church has one staff, one budget and one mission. Larson, who will turn 68 Sunday, announced his retirement during a members’ meeting in the worship center at the Akron campus. The meeting was live-streamed to those in attendance at the Green worship center. After the meeting, an e-mail blast was sent to the membership and a letter written by Larson was posted on the church Web site, http://www.the-chapel.org. Nearly 40 years ago, as a 16 yr. old teenager, I attended a Grace Brethren church camp in western PA for the first time. Knute was the Bible teacher that week. God used him and the messages he shared to bring me to a saving knowledge of the Lord. I was not from a fundamental, Bible teaching church and didn't know the words "saved" and "born again". But that week I realized I was a sinner and my only hope was in Jesus Christ. One of the things I remembered was everyone going to the public swimming place, a nearby lake. Knute sat there reading his Bible. I was embarrasssed for him but also very curious why anyone would do such a thing in public! Wasn't religion something that you did on Sunday mornings? It was the first time that I saw someone "live" their faith in front on believers and non-believers. It impressed me to want to know what was different about what he believed. I am sure that I am just one of many who will spend eternity with the Lord because of Knute's faithfulness in serving God. Thank you. And my God richly bless you as you retire. My grandfather had great respect for Pastor Larson. I can remember (in the late 1970's) hearing grandpa tell my dad that Knute was going to be used in great ways by God.